Could it possibly be game over for the bright minds behind "Grand Theft Auto" and other global gaming hits? UK developers have been quietly churning out video games like the urban crime smash series for decades to great critical acclaim -- and commercial gain. Britons created the "Lara Croft: Tomb Raider" sensation and are rolling out ever-more ambitious projects that can be zapped to phones around the world on next-generation 5G networks. But veterans such as Nick Button-Brown fear that Britain's planned March 29 split from the European Union could shatter an industry that attracts world talent and pushes technological boundaries. 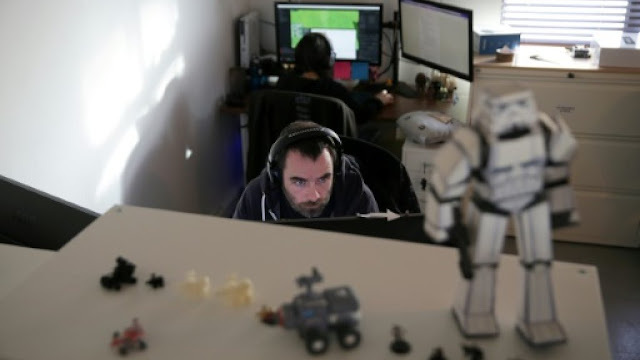 "The gaming industry is very vulnerable to Brexit," Button-Brown told AFP in the computer screen-filled office of a London startup called Payload Studios. Brexit could see Britain pull up its drawbridges: European workers will not find it as easy to move to come here and data adequacy rules that unite the remaining 27 bloc members in a single market may no longer apply. Little can be more disruptive to a business built on the free flow of information and ideas. "I could hire the best people from across the EU and I could bring them over to work with my teams," Button-Brown said. "I can't do that anymore." Gaming is a 3-billion-pound ($3.9-billion, 3.4-billion-euro) industry that employs 20,000 people across the UK. Data from 2017 show EU nationals accounting for 34 percent of that workforce. Around 1,350 of the 2,261 British gaming companies have at least one foreign employee. Vincent Scheurer is particularly worried because he runs a small firm that relies on a tight-knit team of just 26. Larger companies can absorb the cost -- estimated at $10,000 or more -- of visas and the moving expenses of top-tier workers hired from outside the EU. Smaller ones such as Scheurer's rely heavily on EU talent because of the bloc's freedom of movement rules. But London and Brussels have still not agreed the terms of Britain's departure and time is fast running out as the March 29 deadline looms. The dreaded "no-deal Brexit" -- a cliff-edge scenario everyone wants to avoid -- would see London slap the same tough visa rules on EU nationals as it does on those looking from Asia or Africa. "We recruit internationally. At the moment, anyone from the EU can come and work with us, but it's very hard for us as a small business to recruit from outside the EU," Scheurer said. "If those rules now get extended to the EU as well, it's going to make our job of recruiting much much harder." Few markets are as competitive as gaming and the industry's employees are overwhelming young and mobile. Their abilities to code and know what teens want to play on their couches in India or Iran make them hot commodities as far afield as Silicon Valley and the IT hubs of Berlin. Scheurer says the possibility of the pool of labour he can choose from shrinking overnight an "existential risk". Creative Assembly studio director Tim Heaton agrees. "Our industry is culturally global, with the products we create, the people behind them and the players we bring together," said Heaton. "A no-deal Brexit is a barrier to the UK's role in this, and unfortunately there is no one clear action that will protect studios from its impact." The video game market is already enormous and is set to get even bigger when 5G networks start bringing cinematic gaming experiences to the palm of your hand at the blink of an eye. But a no-deal Brexit could could also see EU countries block Britons' access to streaming and other phone services. Even a negotiated exit could force UK companies to comply with a whole new set of EU data rules that carry additional costs and create bureaucratic hassle. Yet the doom and gloom is paying some dividends. Developer Tim Constant said Brexit inspired him to create a game about a dystopian future in which England turns insular and disenchanted. "It's definitely therapeutic," said Constant. "What else could I do?"